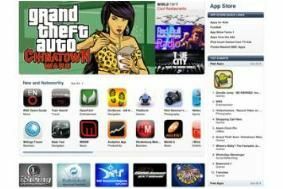 Apple set to hit 4.5 billion apps for iPhone and iPod Touch in 2010 | What Hi-Fi? The latest market research suggests Apple could hit 4.5 billion apps in 2010 and make the company around $6.8 billion in revenue. By 2013 market research company Gartner estimates sales could top 21 billion, bringing in nearly $30 billion in revenue. More than 3 billion apps have been downloaded from the App Store in less than 18 months. Around eight out of ten are available to download free but many of these lead to purchases of paid-for versions. Estimates suggest Apple's App Store has a market share of over 97%, leaving rival offerings from the likes of Nokia and Palm trailing in its wake. Games, shopping and social networking applications led the way but are being quickly caught by apps in sectors such as health and education. At the time of writing, the UK's most downloaded app was... iPint. An app that simulates drinking a pint of lager. There's no accounting for taste, it seems.